Some people aren't meant to pursue creative endeavors, but you don't want to tell them that. 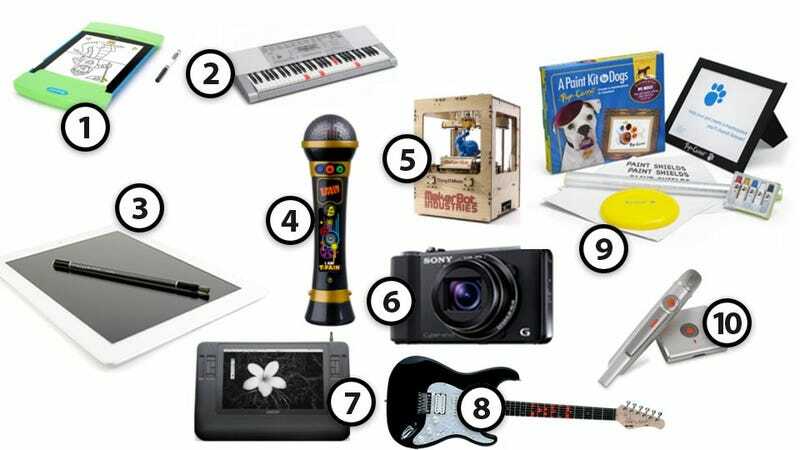 So here are ten gifts that will encourage their efforts, boost their confidence, and improve their skills, even if they're completely and utterly untalented. They say good artists copy and great artists steal. But what about bad artists? Well, they trace. And this case, that turns the iPad 2 into a light-up drawing desk, is way better than just following a book. If your tone-deaf musician's piano teacher has already walked out on them and suggested they stick with the cowbell, Casio's light-up learning keyboard could be their instrument of last resort. A myriad of apps make the iPad a terrific canvas for digital paintings and sketches, but an iOS artiste's real potential could be hindered if they have to poke away with just their finger. Sculpting is a very difficult artform to master, and if you know someone who struggles with even a basic ashtray, it might be time to encourage them to just cheat. The Thing-O-Matic is one of the cheapest 3D printers you can buy, literally printing out models and sculptures from ABS plastic at the push of a button. Photoshop, clearly, is an artform that few have mastered. And using a clunky mouse or a touchpad to alter a photo just makes it that much more difficult. A tablet provides finer control when playing with pixels, and Wacom's LCD-equipped Cintiq line has the ability to detect 1,024 levels of pressure, and even the angle of the stylus. Let's not forget that even man's best friend has a creative side they're yearning to express. You didn't think they tore up your feather pillows for fun did you? Since a paintbrush seems like nothing more than a tool for playing fetch, this dog-centric art kit uses paints squeezed onto a canvas with a protective shield they can walk all over. Still haven't found the right present? Don't worry, we're here all month with a new gift guide every day—right up until the last minute. To see 'em all, head on over to #GiftGuide.